The manual has been prepared according to the syllabus of C.C.I.M. prescribed for B.A.M.S. course of various universities in India. The Ayurvedic part of Shareeraaccording to samhitas has been discussed in section 1 and 2, It provides a sound knowledge for understanding of the Shareera Rachana in general. The important comparative explanation of modern anatomy has been included in the chapters of Shareera Rachana paper 1 and 2. The explanations are given along with illustration diagrams for better understanding of the knowledge. The essential important points of the samhitas have been discussed. This manual is most helpful in practical (Viva-Voce) examination for B.A.M.S. Students. Dr. Giridhar M. Kanthi Professor with teaching experience of 30 years in Shareera Rachana vijnana. He is working as professor and Head department of Basic Principles in S.D.M. College of ayurveda, Udupi. He has awarded Ph.D. in the Sharira Rachana Vijnana by Pune University with gold medal, he also awarded State and National level as a best Anatomy teacher in the field of Ayurveda. He is well known and highly appreciated personality in the field of Ayurvedic Anatomy in the State. He published number of scientificpapers, and attended many workshops and seminars of Ayurvedic and Modern anatomy conferences in and outside the state. He is chairman of the All India Shareera Research Institute (AISRI) regional branch Karnataka and managing editor of Jnana Srotas, a quarterly magazine publishing by AISRI, Hassan. 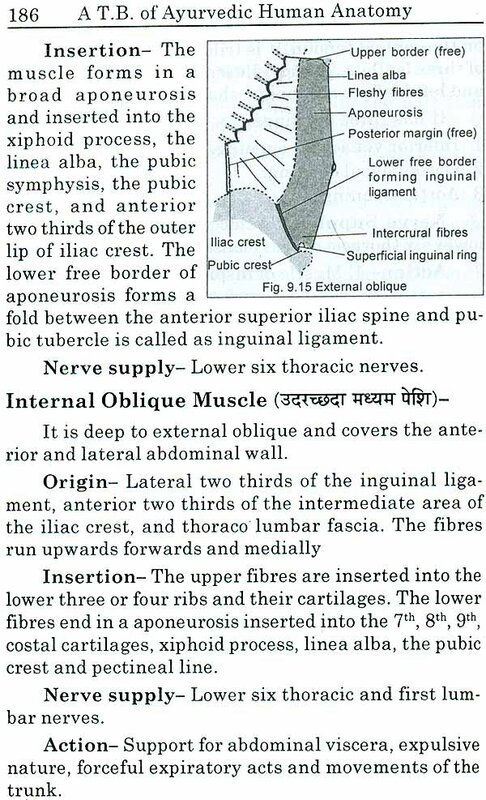 The Human anatomy (Shareera Rachana Shareera) is an important for all allied health sciences. It is one of the fundamental subject to the health science. 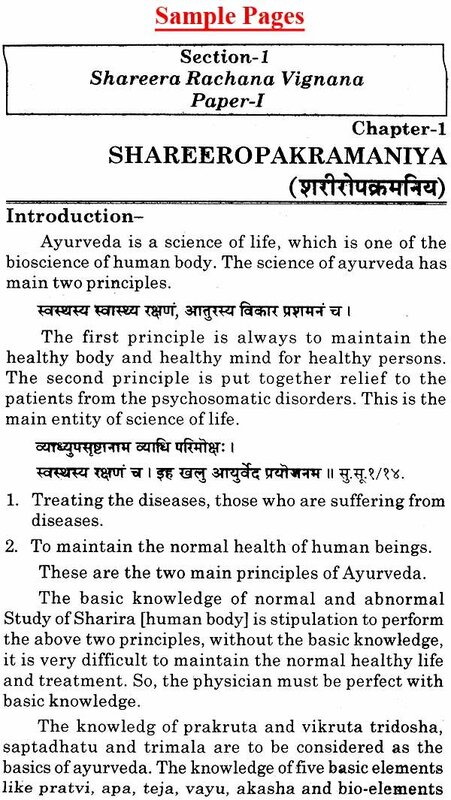 The Ayurvedic life science is also based on the Human anatomy and physiology (Shareera Rachana and Kriya Shareera), without the knowledge of Shareera Rachana and Kriya, the physician cannot become perfect in the profession. So the Ancient Acharyas like Shusruta, Charak and Vagbhata were given importance to the knowledge of Rachana Shareera. 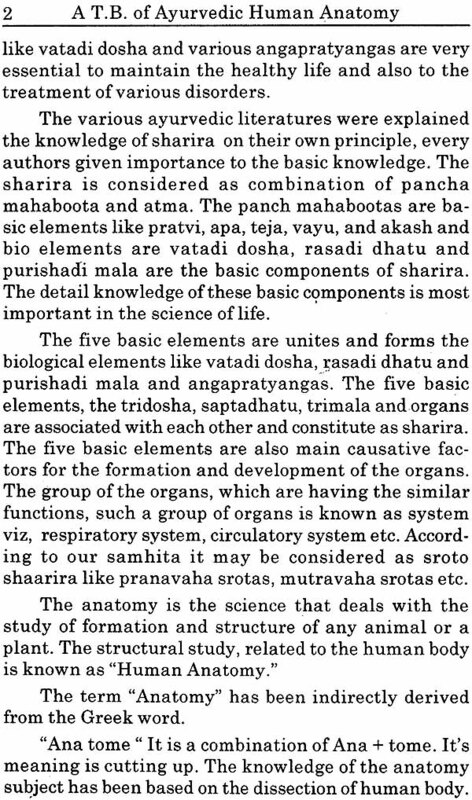 The Acharya Shusruta was mentioned in the share era sthana of Susruta Samhita, other Acharyas are also explained about the human anatomy in their Samhitas. 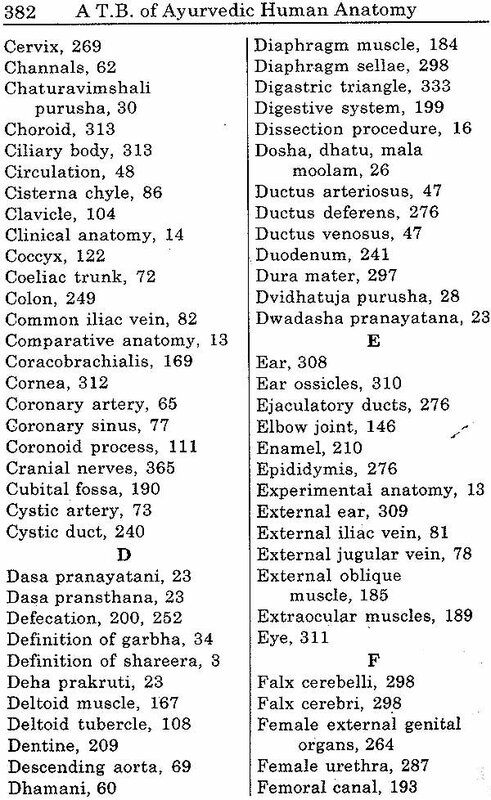 The human body dissection was described in Susruta Samhita. The need of Ayurvedic human anatomy manual is very essential to the students of Ayurvedic undergraduates. 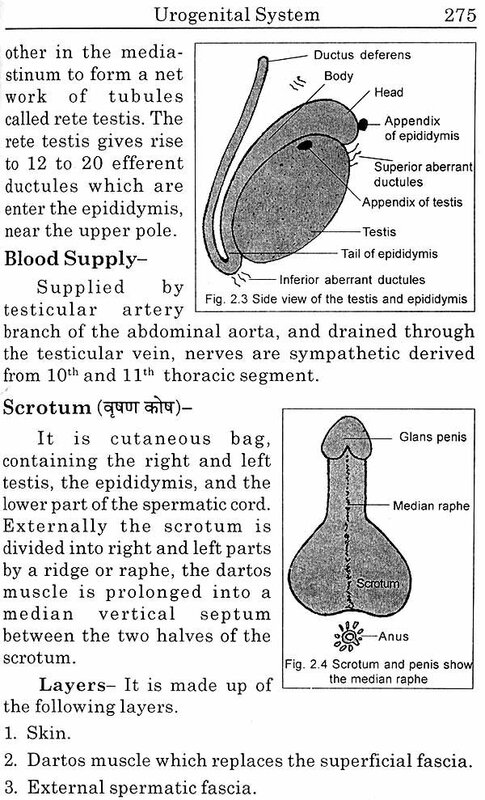 The Ayurvedic students are under pressure to obtain the essential knowledge of Ayurvedic anatomy. 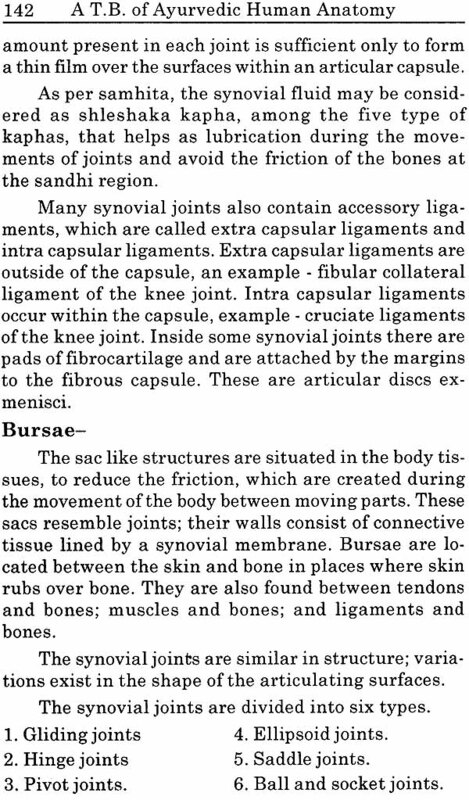 I found that there is deficient of anatomy manual in the course of Ayurveda, keeping in mind we made some effort to prepare the Ayurvedic human anatomy manual. This handbook has been specially designed to fulfil the requirements of undergraduates. In this book care has been taken to ensure that the text provides all the information. Several innovations have been made to make the subject easy to understand. In the past the education was aimed at imparting comprehensive idea ofthe subject. Now the approach is integrated with specificity. The regulations of C.C.I.M. are such that the student should have both knowledge of Ayurveda in parlance with the contemporary science. Keeping these things in mind the present book is written. The book is student friendly and prepares to face the examination and to gain comparative knowledge as well. Section 1- It deals with the Shareera Rachana Paper-I and consisting nine chapters as per the syllabus. Section II- It deals with the Shareera Rachana Paper-II and consisting eight chapters as per the syllabus. Throughout the book, the cross references are quoted to facilitate the student to go into the details of the same. Every effort has been made to compare and understand the views of Ayurveda and Modern. This deals with Chikitsa purusha and utility, comparison of Deha prakruti and applied aspects. This part deals with embryological development of fetus and various factors responsible for the proper development and causative factors for the fetal anomalies. An attempt "is made to compare the concepts of Ayurveda with that of Modern embryology. 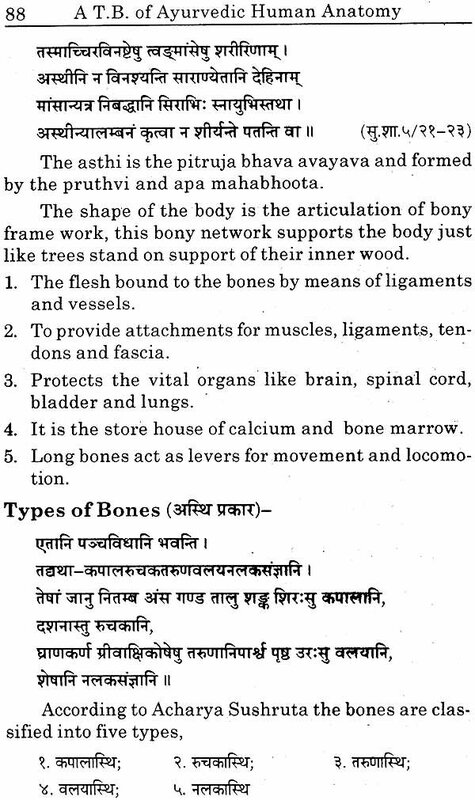 The nomenclature, terminologies and Pramana of the human body and definite mana for anguli are defined. 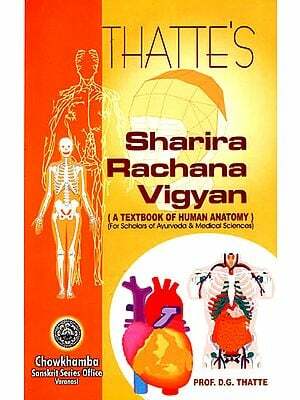 The Arterial and Venous system with illustrative diagrams, equivalent terms, comparisons and differentiating characteristics of Sira, Dhamani and Srotas, the Sroto Shareera deals with various srotas with their applied aspect in practice. 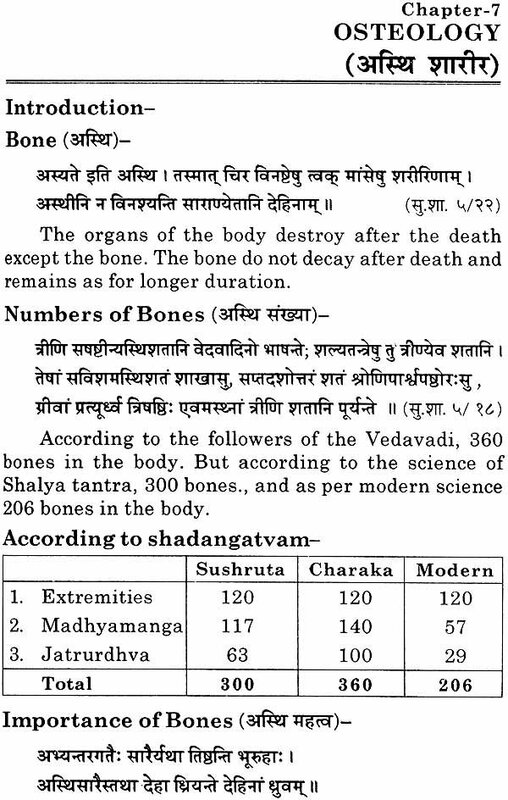 Chapters 7 and 8 - Asthi and Sandhi Shareera- A comparative account of Asthi share era with Osteology is carried out with illustrations and diagrams. In Sandhi shareera, comparison is made of various sandhi with that of contemporary science. 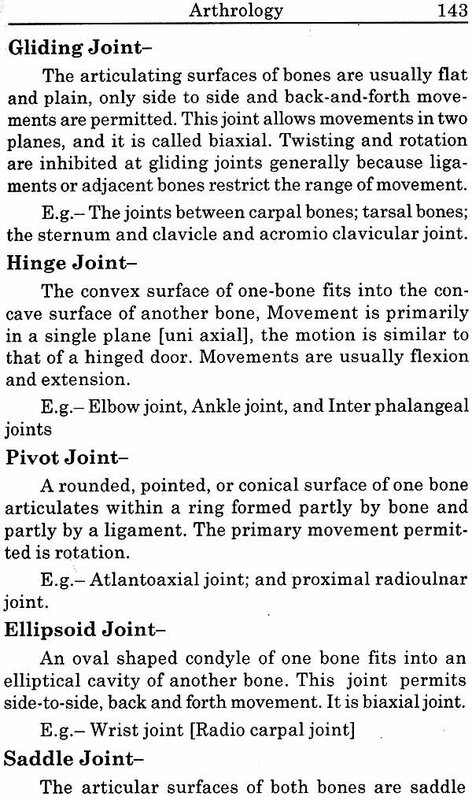 The descriptive anatomy of various muscles of upper limb, lower limb, head and neck are dealt in detail with illustrative diagrams wherever necessary. 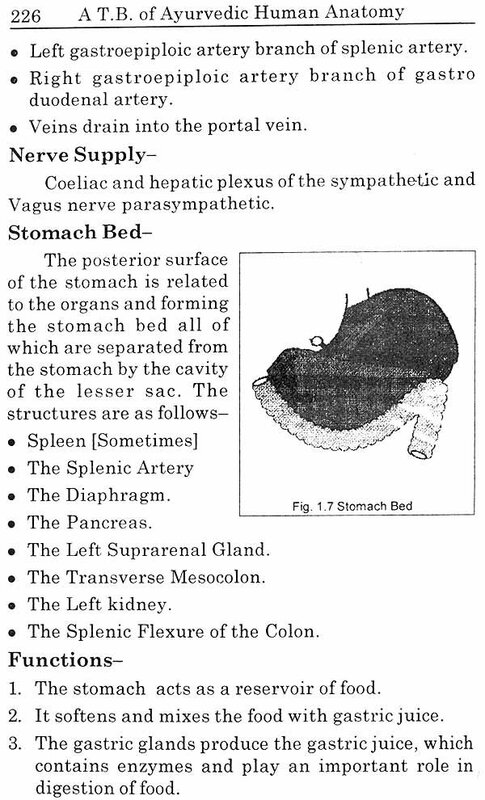 The different organs in the Thoraco-abdominal cavity are described with nomenclature terms, according to Samhita and Modern science. The illustrations are made accordingly. 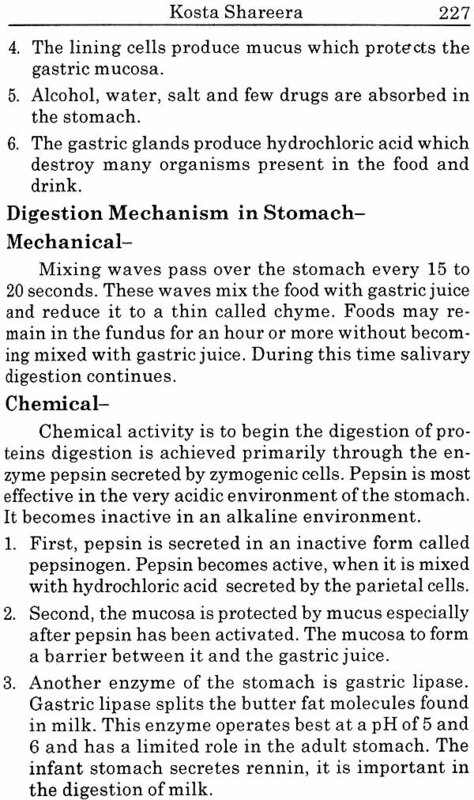 This chapter deals with the organs involved in Urinary and Genital system. The various Kalas are dealt :i:n detail with its applied anatomy. 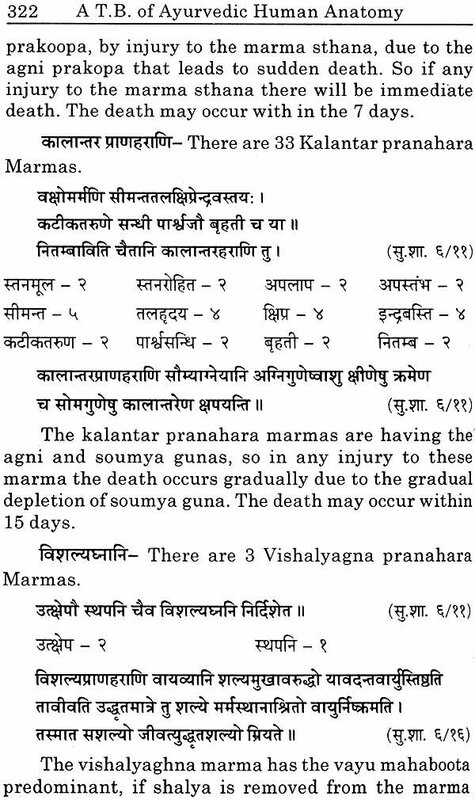 The Jnanendriyas are described in detail. 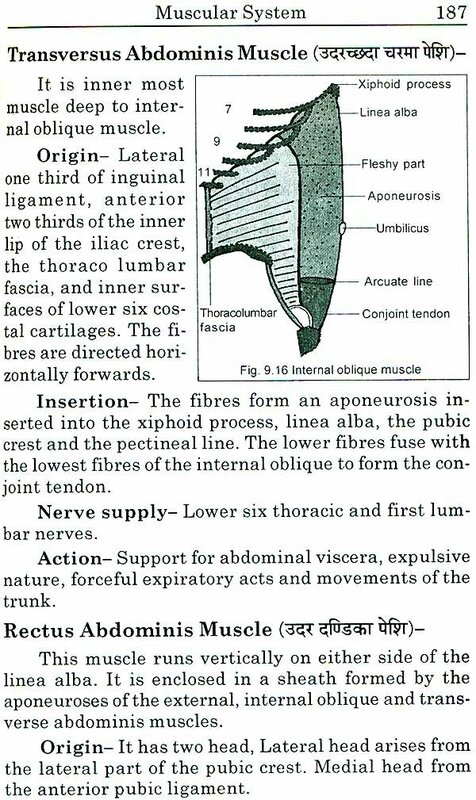 The Rasanendriya has been dealt in, while describing-the Tongue along with Koshta, as it is an organ of Gastrointestinal tract. 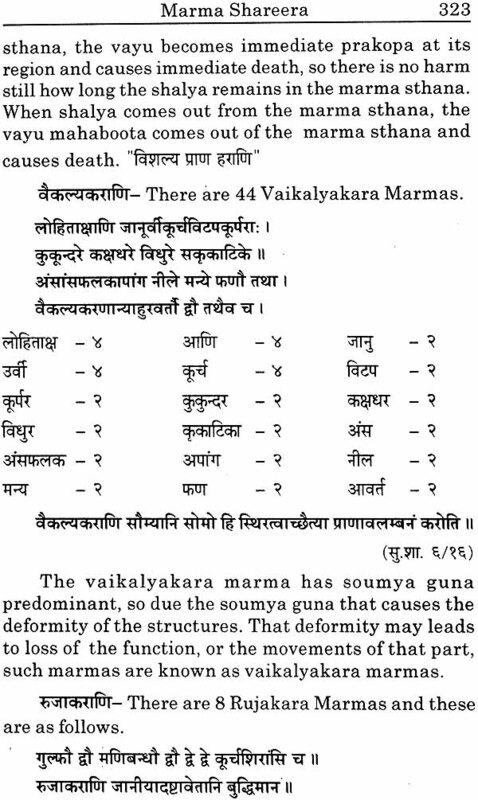 The need for study of Marma in relation to medical practice and surgery are highlighted and various Marmas are described with illustrations. The brief descriptions of endocrines are dealt with the major endocrine glands like Thyroid and Pituitary glands are illustrated in detail. . The nervous system has been narrated with illustrative diagrams and applied anatomy including some physiological points. 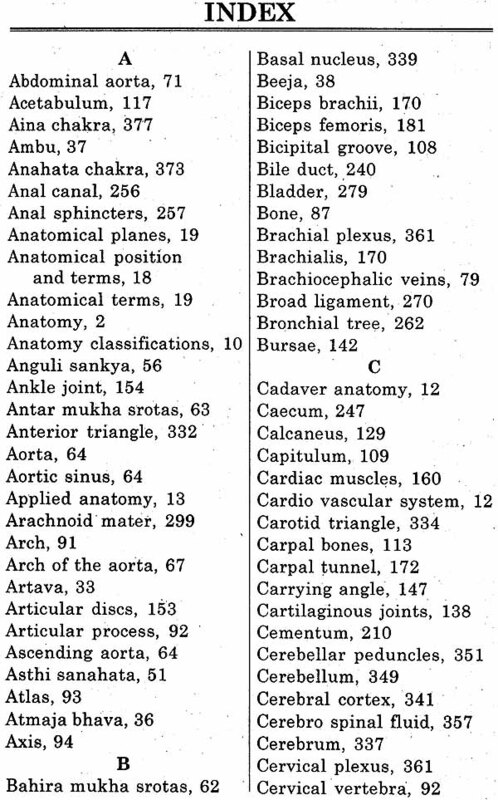 The Shatchakras and various nervous plexus are dealt along with anatomical importance. The author has made every e ndeavor to see that to update Ayurvedic stock of knowledge in general and students in particular. I have been privileged in having the invaluable cooperation and guidance of my friends and colleagues. I would welcome suggestion to this end both from teachers and from students.